PVC vented high efficiency wall furnace. 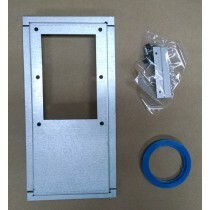 Can be vented horizontally or vertically. 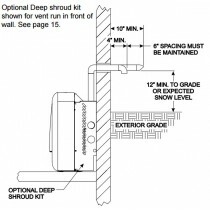 Unit may also be installed with a fresh air intake for a two-pipe venting system. The Empire Ultrasaver is power vented of which your venting options are extremely flexible due to its modern forced air furnace "like" design. Runs off propane or natural gas. The Ultrasaver works at high altitudes. The control panel has 5 heat settings, a built in thermostat, and a modulating blower. 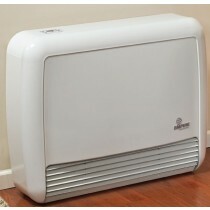 The Ultrasaver 90 can also be operated by remote control or any standard 24V wall thermostat. This unit does require electricity to operate. 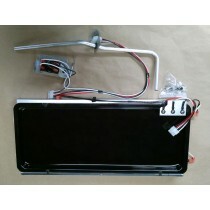 You will also need a condensate drain, condensate pump, or the optional condensate evaporator. The condensate evaporator will add humidity to the room by turning the condensate into water vapor. 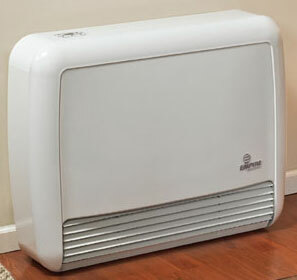 The Ultrasaver 90 is more efficient than any vented heater on the market including ducted central heating systems.